While he did run 4th in the Junior Steeplechase in 1960 and came 1st in a 50 yard freestyle race in 1961, it was in 1962 that Joe really started to make his mark on Whangarei Boys’ High School. In that year he was the Senior Gymnastics Champion, was a member of the 1st XV rugby team, being awarded School Colours for this and was awarded the Prize for Woodwork that year, an indication of the professional career that was in front of him. He also achieved School Certificate having missed out the previous year. In 1963 Joe was A Carruth House Prefect, A School Deputy Prefect, The Form Captain of 6B2 and a member of the gymnastics team, having come 3rd in the Senior Championship. He was also a member of the 1st XV rugby, again being awarded School Colours, and went on to represent Northland Secondary Schools and the Junior Vikings. He also found time to be the Vice-captain of the School rowing team. Upon leaving school Joe took up a carpentry apprenticeship and eventually his career led to the formation of Morgan Engineering, in conjunction with his brother Brian. However it was his rugby that was to leave an indelible mark on the people of Northland and also New Zealand. Joe first came to the notice of North Auckland sole selector-coach Ted Griffin as a 21 year old when he was playing for the champion Mid Northern club team and made his debut for North Auckland team in 1967. 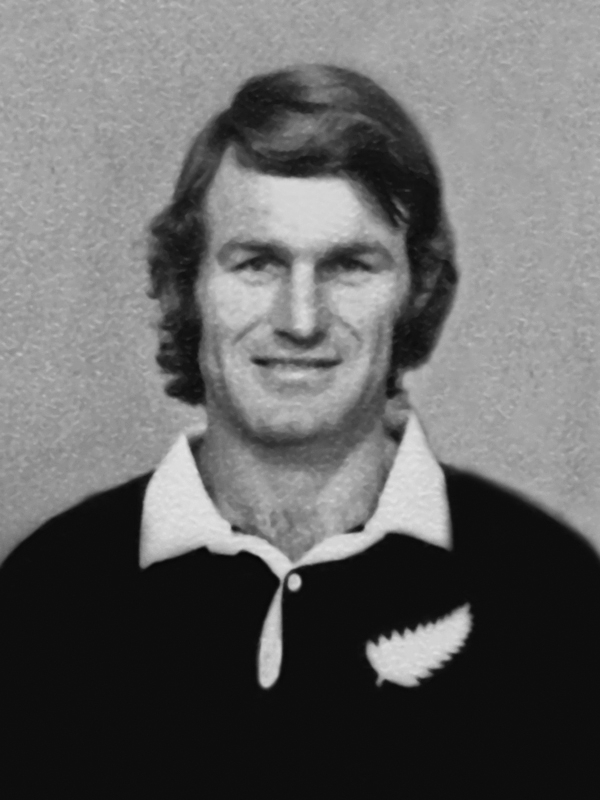 When he eventually retired from representative rugby at the end of the 1981 season at the age of 36 he had played 167 games for Northland and this still makes him number one on the all-time list of Northland appearances. He was to feature in some of North Auckland’s greatest moments including two successful Ranfurly Shield challenges against Auckland in 1971 and Manawatu in 1978. Joe is attributed with possessing rugged defence and raw courage but also was able to show deft footwork and sound judgment on the field. And it was these attributes that finally saw him selected into the full All black side in 1974 at the age of 28 for the tour of Australia and then for the tour to Ireland to mark the Irish centenary. It was however the tour to South Africa in 1976 that really marked Joe’s arrival on the world stage where, in the 2nd test, he scored what is still today often called one the greatest solo tries ever scored by an All Black. To recall, from a scrum, Joe gathered a classical no look reverse pass from his Mid Northern and Northland team-mate, Sid Going, and set off through a gap on brilliant 30 yard solo run to dot down untouched near the posts leaving the South African defence in disarray. After retiring from the game, he coached Northland representative teams most notably the Northland under-18 side, the Northland 2nd XV and Northland Colts, whose players all swore by Morgan. But it isn’t just Joe’s impressive career as a rugby player and coach that has left an indelible mark on Northland, because Morgan contributed so much to the community he lived in that his rugby was almost a mere distraction. Almost. Committed family man, dedicated member of school committees and the ultimate bloke at the dreaded working bee, Joe was also a successful businessman, respected boss and talented member of a local entertainment group called “The Maromaku Players”. It was his willingness to throw himself, and the resources of his business, Morgan Engineering, into various school and sporting projects that also endeared him to many other sects of Northland society. Joe helped build school tennis courts, upgrade community halls, install floodlights, lay drains and re-roof buildings. Often he would offer his employees to do the work, but end up doing the bulk of the labour himself. Joe Morgan died on December 22, 2003 five days after sustaining severe head injuries in a fall at a construction site in Whangarei. The Whangarei community lost one of its favourite sons that day and one who will always have a special place in the hearts of all Northlanders and Old Boys of Whangarei Boys’ High School. In recognition of his contribution to Northland and New Zealand rugby and his service to the community, Joe Morgan is the 3rd inductee into the Fideliter Fellowship.